Music is an essential part of wedding. However, there are other sounds too which are essential for a wedding. There are speeches, announcements, and other such sounds which are necessary components of the big event. If all these sounds get excellent equipment for the right modulation, amplification and transmission, it becomes an amazing experience for the wedding party and guests. 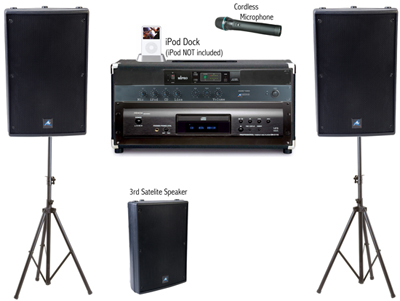 You can hire such an excellent equipment package at audiopod-vic.com.au – a wedding hire in Melbourne, Victoria, Australia. As such Audiopod-Vic provide equipment for all types of events, but wedding is their specialty because they love weddings. Being a small business, they are able to provide personal service to their clients. They strive to give the best to their clients because they care for them. They are available 7 days a week and you can call them throughout your big day. Wedding Hire Melbourne Pack – This contains iPod/audio cable for connecting your any music player like iPod or laptop, etc, wireless microphone, 2 powerful speakers perfect for the dance floor plus one more speaker to keep at the backside to facilitate clear sound for the guests sitting there, cordless hand-held microphone for speeches and built in CD player. Disco Lights – This is an amazing package to create the right party mood; it contains 2 intelligent disco lights installed on lighting stand. 3200 Lumen Data Projector and Screen – This contains a 3200 ANSI Lumen data projector, 100” tripod screen and HDMI or composite or VGA input. Mipro MA708 Portable PA – No worries, even though you are throwing a big 300-guest party, this portable PA is convenient for your event and it runs for as long as 8 hours. It has iPod/audio connection, up to 2 wireless microphones, speaker stand and microphone stand. 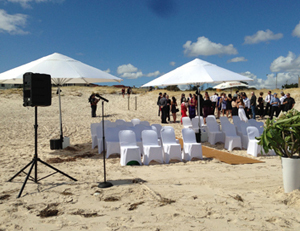 What’s more, Audiopod-Vic have wedding equipment hire for garden or beach weddings too. It contains Mipro portable PA with cordless hand-held microphone, stands for speaker and microphone, connection cord for music, shade umbrellas, plastic garden chairs, trestle table for presents, bar, etc, round tables for cake, presents etc, and anything you want. You can also hire shade umbrellas with stands and weights, and also powered speakers for your outdoor wedding. Audiopod-Vic has everything that you may want for your wedding. Audiopod-Vic charges nothing for setting up the system, so you get a ready-to-use system. Delivery is free within the Melbourne metro area, i.e. about 12 km from CBD. The prices of the packages include that of cables, cords, set up, pack up, and any small extras. No surprise costs to bewilder you. So, if you are planning to celebrate your special day in or around Melbourne and are wondering about whom to approach for your wedding hire, look nowhere else than Audiopod-Vic for an awesome sound system, to get the right party mood, and a clear communication.